I always try to be very mindful of the need to take pupils into the ‘unknown unknown’. Indeed, I suspect that the type of teaching that only delivers what was stipulated at the outset is one of the main causes of the death of curiosity. It seems to me that young people have not – entirely – lost their curiosity, but that needs must dictate something beyond the limits teachers traditionally drew. This week, curiosity was roused by an unusual errand that a pupil was asked by her tutor to run for me. As the colleague concerned also happens to be my lift-share and near neighbour, questions were forthcoming asked about our friendship. Normally, I would respond with ‘don’t be nosey’– but instead I responded to the question, “Who is your best friend?” with the reply, “My wife”. It seemed to gain approval. I was then asked whether the teacher concerned was “my best school friend”. I replied that it takes many years’ knowing someone before I would consider them to be a ‘best’ friend, but yes, said individual is a good colleague and indeed friend. I could see the cogs whirring – and again the response was favourable. Thus far am I prepared to go in the hope of compensating for some of the more antisocial attitudes to which modern children are exposed. I think the positive reception was down to the unexpected answers – and I hope those children are marginally wiser as a result. The need to challenge understanding arose again later in the week – but this time the surprise was on me. We are often urged not to under-estimate children’s prior knowledge, and I suppose this relates to differentiation. I have always had strong reservations about formal differentiation – I worry that its real effect is too often to constrain progress, while being yet another source of additional work for the teacher that skilled heuristic classroom practice can actually remove. And furthermore, I have deep issues with mixed-ability teaching which is the provenance of the concept. PowerPoint (and Prezi) may have their detractors, but for the geography teacher, they are a god-send, to the extent that virtually all my lessons use them at some point. The capability to bring images of the real world directly into one’s teaching, to annotate, inter-leave with data, animate ideas and more is, in my view unsurpassed. Over the years, I have increasingly also used them as a tool for differentiation. My typical lesson plan will involve the making of a PowerPoint. I hasten to add, I do not use it to script lessons, as I see done often. For me, it is a matter of preparing the images and information around which my narrative, discussion and other activities will be built. I used to prepare differentiated presentations for different classes, but increasingly I have integrated differentiation into single presentations. This makes for lots of slides – for example, there may be several consecutive slides which present different complexities on the same issue. Judicious use of the freeze button allows me to select either more or less complex versions of each concept according to how the lesson is going. I can simplify or complicate pretty much at will. Each lesson ends up being a unique combination of images, while still allowing me to teach in the traditional, teacher-led way that I prefer. The week’s second surprise illustrated its potential: I was introducing a new topic, sustainable living, to various classes. The task in hand was to define and discuss under, over and optimum consumption. I expected that less able classes would need considerable time on this while more able ones could progress to the extension tasks. But as the week progressed, it became increasingly clear that the concepts were alien to virtually all pupils. Even the most able struggled with the abstracts behind taking too much – and perhaps too little – from our environment. Far from being conceptually ahead, the brightest class actually took longer to assimilate the ideas than some of the supposedly weaker ones. If they were thinking about in more sophisticated ways, then it was certainly well-hidden. In fact, they simply struggled. While this is not customary, neither is it unique. I find it concerning that in recent years, I have encountered many able pupils whose on-the-ground practical and cognitive ability appears little different from supposedly much weaker students. I fear it is the pernicious effects of media and commercialism that are increasingly levelling down to the same common denominator – but the able have further to fall. In a lot of cases, attitudes to learning seem to be taking the same trajectory. Far from stretching children to new heights, it seems the job in hand is increasingly remedial – of bringing pupils up to what one might once have deemed the starting-point. Luckily, creative uses of the tools to hand should make it possible to squeeze rather than stretch – even if we worry that it shouldn’t be necessary. Shortly after Christmas 2013, an off-duty rail worker, Matt Lenton noticed a man behaving oddly at his local station near Brighton. He engaged the man in conversation, and his suspicion was confirmed – that the man had been about to throw himself in front of a train. They talked, and Lenton then drove the man to a nearby garden centre for a coffee. Several hours later, and after having passed on the Samaritans’ phone number, Lenton took the man home, giving him his own phone number in case he ever needed ‘non-helpline’ help. This incident would never have been known if it had not been for the man contacting Lenton’s employer, as Matt Lenton himself said nothing. He was recently given an industry award for his actions. The significant point here is Lenton’s subsequent actions: he just went home and said nothing to anyone. The citation at the award ceremony said that he didn’t feel he had done anything that anyone would not do under the circumstances. One of the key components of a vocation such as teaching is that it is done selflessly. Just as Lenton just went home at the end of that day, so teachers and those in other caring professions should do the same. There is no need to trumpet what one has done; even if one can be certain of one’s effect, the purpose of causing it is simply the knowledge that good has been done, not any benefit that might accrue to us from doing so. 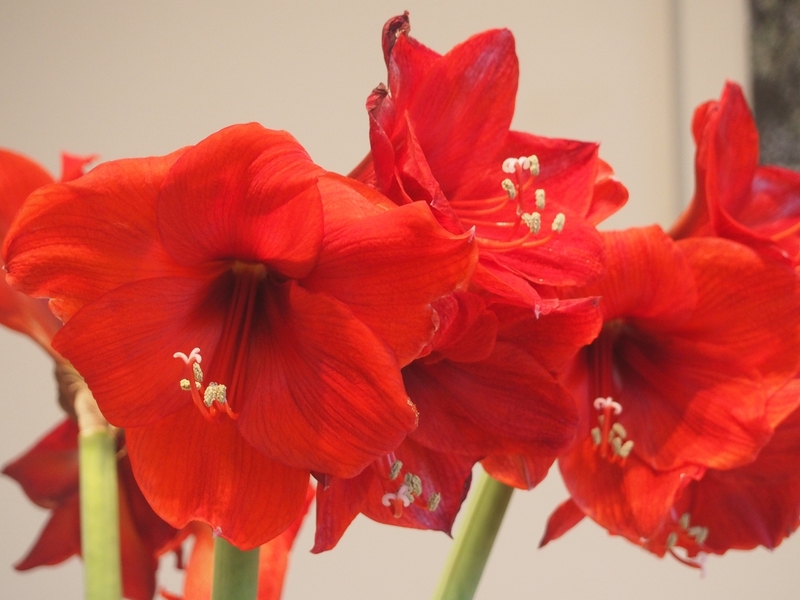 I always buy my wife amaryllis for Christmas, and I too am very fond of them. Their deep red is the symbol of Christmas, and their shamelessly sculptural shape is striking. They sit very nicely as a bold table centrepiece in our modern interior. There is no point in analysing a flower any further: one cannot quantify beauty, or the pleasure it brings. It is meaningless to try to score it; and pointless even to ask how beautiful it is, let alone to attempt to compare different flowers in anything other than an utterly subjective way. Trying to quantify them in terms of value is fairly pointless too: while flowers clearly do come at a price, this is only in part a reflection of their desirability. One also needs to factor in supply-side considerations, their seasonal nature and the avarice (or lack of it) of the retailer before one reaches a figure. And this has little, if anything to do with the inherent beauty of the object. There is a large amount of Life that also ‘just is’. Like Lenton’s act, and like the flowers, any further analysis is simply pointless, in the sense that it adds nothing, and may even detract. Yet we seem to be losing sight of this fact in the great quest for quantification and accountability. It seems that we are no longer content to appreciate inherent value: what we need to know is the price and our consequent ‘greatness’ relative to others. This turns everything it touches from something of inherent to contingent or relative value, and we are doing this not only to objects, but to the acts of living and doing too. Evaluative self-scrutiny – the measuring of one’s social capital – has become such a widespread phenomenon that we risk spending more time on it than on doing things in the first place. Social media must take a lot of the blame, as must the pressures of accountability: actions risk becoming validated by the response they receive rather than by the doing of them in the first place. The depressing effects of social media on people’s self-perception are becoming more widely known, and I think the same phenomenon is having a wider effect on modern life in general. The self-conscious notion of ‘lifestyle’ becomes the enemy of the fulfilling life it describes; the concept of ‘career’ the opposite of a job well done. Professional practice in many walks of life risks falling into this trap, but perhaps none more so than in the public services thanks to the scrutiny agenda. In education, the focus on ‘goodness’ and ‘greatness’ is part of this. Quite apart from the inescapable subjectivity, nay meaninglessness, of such terms, obsessing about these matters simply diverts attention from our core purpose. And yet this is has become a significant part of educational activity: institutionalised navel-gazing, the purpose of which is ostensibly to guarantee quality and hoist-up minimum standards. But its real intention is self-aggrandisement. Developing from this is the burgeoning number of conferences, research activities and publications. Watching ourselves is becoming bigger business than doing what we’re meant to be watching in the first place; being seen to be good is more important than just being it. Books with titles like “Teach like a Champion” and “From Good to Great” are predicated on the assumption that there is some kind of meta-knowledge that we can eventually attain which will transform our effectiveness. But the cynicism and manipulativeness implied by such titles are beginning to grate with me. I’m not suggesting that a degree of self-awareness is not a good thing – but this is rather different from the whole infrastructure that is springing up to impose others’ understandings of it on us. Yes, there are things to be learned from reflection, but we risk over-formulating the practice of teaching – and most other aspects of modern life – at the expense of simply getting on with it. As numerous recent events worldwide would suggest, while we never know how many disasters never happen, the fact that calamities do still happen suggests that it is impossible ever to second-guess the future.We will never escape the raw fact that life has to be lived as it happens, and that shifting our eyes from that fact to meta-analyses simply takes our eyes off the ball, as a result raising contingent stakes in a way that can actually make matters worse. I wonder how Matt Lenton’s experience could have played out differently if it had been possible to anticipate it. It is possible that as a Rail Neighbourhood Officer, Lenton has received training in how to deal with suicidal people, but even if he has, it is questionable how useful it was on that day a year ago. The fact is, every event is unique, and attempting to deal with it as though it were simply part of a larger pattern may be self-limiting. Treating vulnerable people as ‘just another case’ is close to the worst thing to do. There is the fact that the incident happened when Lenton was off-duty; one wonders how his being on duty would have changed things. One cannot schedule suicide attempts to coincide neatly with the duty-turns of those who encounter them, but one wonders whether Lenton’s mind would have been less focused solely on assisting that individual, or whether he would have been preoccupied with following protocols and guidelines – and whether his actions might literally have been fatally flawed by that fact. For it seems that the defining element of Lenton’s heroism was precisely his authenticity, and it was his sincerity that changed the man’s mind. Had he appeared as merely the face of officialdom, the effect may have been very different. He may also have been aware of the need to report his actions afterwards, of the need to fill the inevitable paperwork, and the fact that this could conceivably contribute to his personal advantage. He undoubtedly could not have just gone home and said nothing: his interests would inevitably have been divided between genuine compassion and his professional obligations. I suggest that Lenton’s freedom to operate purely as he needed was the crucial element in the outcome that day; that the constraints of professional accountability may have fatally constrained his actions. There is little point in trying to specify what makes flowers beautiful; they just are. Musing on this over breakfast the other day, while admiring our Christmas amaryllis, did not get me far. Apart from the aforementioned qualities of colour and form, I was reduced once again just to enjoying them for what they were. Colour and form may be useful concepts, but they do not embody those qualities, only describe them. The only way to appreciate the flowers fully is just to take them for what they are. The modern tendency for meta-thinking will likewise only get us so far; just as identifying procedures for dealing with would-be suicides or knowing that flowers beautify a room is not the same as doing or experiencing them, being able to identify certain qualities that make for successful teaching is an entirely different prospection from delivering them, let alone guaranteeing them. Yet one is left with the sense that, if only we can define these things, then that in itself will be enough to guarantee both their use and effectiveness. Why else the obsession with pinning it all down so far? But it is not so; life will still need to be lived in the moment, as much in the classroom as anywhere else. Equipping people with meta-knowledge about what they are doing may not be without its uses, but I suspect that it is much less useful than is currently being claimed. I am also suspicious that the claims made for such meta-knowledge, with labels like ‘good’ and ‘great’ are of less relevance to actual classroom practice than to the self-promotion of those applying them to themselves. The salient factor about Matt Lenton’s story is that he just went home and said nothing. The important thing was the doing of the deed, not the acclaim that could have followed afterwards. In fact, thinking about the latter may well have led to an entirely different outcome, as his employer later recognised. The important thing about amaryllis is that they just are, not why they are. Both Lenton’s action and the effect of amaryllis in our Christmas home are indeed great – but their greatness is merely a by-product of their being what they are. In both cases, setting out to be great (if flowers had consciousness…) would actually diminish the effect. It would just turn to narcissism. Teaching and learning are just the same: they are best done unconsciously, just for the sake of it. The modern obsession with form over function risks getting us nowhere fast, and using it to self-label, whether as good, great or anything else is creating a hostage to fortune. We need to just get on with teaching as best we can, each moment for itself – and let go of the obsession with greatness. This is not to say that there are not great things in the world – but as both Matt Lenton’s story and my favourite Christmas flowers show, while greatness does indeed derive precisely from the subjective acclaim of others, it is really only earned by authenticity, not acquired by the self-conscious seeking of a deluded form of greatness for its own sake. Some days ago, ‘Disappointed Idealist’ posted a long polemic about the shortcomings of educational management. I commented on what I felt was a heartfelt and perceptive observation, since when a dialogue opened up between Ian Lynch and me on the comments section. I don’t think it is reasonable to conduct an extended discussion on the comments board of someone else’s blog, so I have moved here to continue my response. The following is therefore a specific reply to Ian Lynch’s comments, in effect an open letter. The previous discussion can be found here. Have you come across Margaret Heffernan’s book Wilful Blindness? If not, I suggest you read it. It might explain some of my doubts about the efficacy (or should that be sanctity?) of management. I suggest you also look at Obliquity by John Kay, and Drive by Daniel Pink for why the current approach is wrong and doomed to failure. Details of all of these can be found on my reading page. They represent, of course, just one world-view, but I think we can probably agree that management is a very complex matter. I will repeat: my objections are not some kind of a grudge. Indeed I have always tried to act in a constructive and professional way for the management of my school; they deserve respect for the difficult job they have undertaken. But equally, no one makes people take those jobs. Too many of them may have been taken due to personal ambition rather than aptitude. The view that you can do more good from higher up is, in my view, deeply flawed. My own early attempts at entering management were, admittedly, unsuccessful; there may have been many reasons for that, but with the benefit of a lot of hindsight, I am greatly relieved that I never did so. I think I was not ready for it at the age when it was expected that one ought to be looking for junior management roles, and somewhere inside I knew that. I will admit that I would also find it very difficult to suppress my own strongly-held views and experiences just for the sake of holding the management line. Maybe, in the conventional sense, that made me unsuitable. Teaching is a job where long service delivers perspectives that simply are not available to new entrants, no matter how talented they may be, and particularly if they flit from school to school. How much bad management is a result of people being pushed to take roles for which they have insufficient experience or perspective? Decades of doing the job throw a very different light on what is important and what is not. Young turks may not see this, instead being more anxious about making their mark. So much damage is done by actions that have little to do with education and everything to do with demonstrating the so-called effectiveness of the manager. As you say, this is made all the worse by the accountability trap. Management as a concept is predicated on the belief that it is possible to control things centrally. This in turn is based on the view that things happen for identifiable cause-and-effect reasons. While this may be partly true in the material/mechanical world, it is not as directly so for the behavioural world, even in the commercial sector (think bankers’ behaviour). The causal density of human behaviour and interactions is so high that it is effectively impossible to identify, let alone anticipate, the actual effects of one’s actions. Therefore, management is doomed to failure because it is simply attempting too complex a task, to co-ordinate closely the real behaviour and motives of a hundred or more adults, let alone the children. This is all too visible in the amount of time people spend trying to circumvent imposed constraints on their actions and trying to cover their backsides from the perceived or real consequences of not doing what management wants. This is not productive activity. In any organisation, management is a construct. It does not produce anything of itself; it is not the core activity of any organisation. It therefore constantly needs to reinvent reasons for its own existence – and these largely consist of coming up with new ways of telling other people what to do and then checking up on them afterwards. Sometimes that may be helpful or necessary, but it all too easily becomes a self-serving activity the key purpose of which is to preserve its own raison d’etre, let alone the prestige of those in those roles. As I mentioned before, it sets up too many conflicts of interest ever to be otherwise. I am an educated, thoughtful and conscientious individual, and I do not go to work to be patronised, or told what to think and do with no reason, like a mindless automaton. My loyalty is to be won, not demanded. I expect to work hard, but I do not expect to have the job made more difficult than it needs to be. I have a life beyond work to which I am entitled, and I do not expect to be condemned or criticised for protecting it. I do not expect to have it gratuitously invaded by people who seem to think they have unlimited rights to my time. You may argue that such things are inevitable; be that as it may, the effect in terms of morale, let alone dehumanisation of the workplace, is still the same. You suggest that we need to accept that which we cannot change, but I see no reason why I should accept the distress and demoralisation of either me or my colleagues just because it seems that not much can be done about it because I am not powerful within my school. That is not the same as claiming that such things are done deliberately – though there are times, even in a good school like mine, when it comes close. There are some things that are simply wrong – and the way that too many people get treated in the workplace is one of them. It is not compatible with a modern, civilised country. As for doing something about it, I have spent my career fully engaged in professional dialogue both within the school and more widely – but you cannot discuss things with people who are unwilling to listen, and who in effect consider they know better because they are somehow ‘more important’. You cannot change things from the inside if you cannot gain access to the inside because your ideas don’t ‘fit’. I have acted in numerous roles in an attempt to argue certain cases – always with the same conclusion: the default position of management seems to be to listen to nobody but itself – and to do what it wants regardless. Ironically, increased local freedoms only seem to have made this worse. No matter how inevitable you think this is, the effect is too often a destructive culture within organisations whereby too much effort is expended on in-fighting and the them-and-us mentality which often exists. While there undoubtedly are individual teachers who hold grudges, I am genuinely not one of them – and I still feel I can say that over nearly thirty years, the divisions have been created more from above than below. We would be much better off accepting the real limitations that exist on the ability of a few often-remote individuals to control the minds and actions of others; it is the inability of management to accept this fact that causes a lot of its problems. Management would be more effective, if it accepted that its job was to establish minimum expectations, go about winning hearts and minds by creating a good ethos and then allowing people to operate within those basic expectations with as much freedom as possible. Tom Sherrington wrote as much a few months ago. Certainly there is a role to weed out the genuinely bad, but the constant drive to impose uniformity on people does nothing more than deny human variability and individuality and is guaranteed to cause dissatisfaction and demotivation. You may claim this is idealistic – but there are countries where it works, such as Switzerland (as I have written before in these pages). I have seen teachers working in a genuinely collegiate manner, with a minimal flat management structure for overall coordination. It works fine – and it also used to work in this country – until the point when education caught management sickness and it became the only real route for ambitious teachers to ‘prove’ their worth. I have also worked in leaderless teams at times – and nothing ground to a halt. Belgium ran itself for many months without a government, while the Soviet Union collapsed under its management’s inability to control its citizens’ lives sufficiently closely to command their compliance. That is the reality of reality – it is oblique and polycentric; it does not work to centralised command, no matter how much some people might want it to. The biggest obstacle to improving this situation in this country is the confirmation bias that tells managers that the only solution to poor management is more management. Certainly we need some – but not the debilitating parasite that it has been allowed to become. Until they accept that management is no more indispensible and no less fallible than the rest of us, we are not going to get far. It’s all too easy to sound like a broken record when you land on a good idea, especially if few others seem to be noticing it. Reading a recent blog brought my mind back to one of the enduring ideas that I have read about in recent years, namely Obliquity. Experiencetomeaning is suggesting here that consciously trying too hard to achieve something can have the opposite effect. In my experience, he is right. Two other pieces I read in the last few days also seemed to be touching on Obliquity – but nobody seems to have noticed it for what it is. I would recommend John Kay’s book on the subject to all who work in education, for its simple core idea: very often the things we most want are least-well achieved by wanting them all the more. In other words, Obliquity is the Art of Letting Go. I have never met John Tomsett, though people I know who have attest to his utter decency and dedication. His was also the first edublog I encountered. Some weeks ago, he made a passing comment about being able to hold contradictory views simultaneously, for example by placing faith in randomised control studies while also putting in place seemingly unscientific courses on Happiness. He bemoans the loss of rigour in English Literature courses, while simultaneously accepting that he is probably part of Gove’s Blob, and his writings over a period of years seem to confirm this schizophrenia between deeply humane values and management-itis (sorry John). We will set aside the problems caused lower down command chains by senior managers who send contradictory messages (which is not to deny the honesty in confessing to such dilemmas), but I wonder whether Tomsett has considered that his espousal of Blob philosophies might actually be the cause of those diluted standards. In many cases, is it the traditionalists whom the Blob has dismissed for decades who have actually tried to uphold academic quality, whereas all the full-on progressives with their radical new ideas seem to have achieved is – yes – those lower standards. I also wonder what Tomsett hopes to achieve by teaching happiness. I can imagine the groans from his year 10’s in September, and the gradual decline of that course to the pupil-status of Citizenship and PSHE. Personally, I think I would take great exception at someone presuming to teach me to be happy. Not that Tomsett isn’t in good company of course, because Wellington College under Anthony Seldon has taught this course for a number of years. A look at Seldon’s work with Richard Layard might even convince that there is something in it, and for a long time, I would have agreed. (In fact, I still do, it’s just how you go about it). A piece reported on Radio Four this morning linked to comments by Tony Little, the headmaster of Eton, saying that our education system is too exam-orientated, and that it is narrowing the experiences that children have. The DfE naturally responded, saying that there is no tension between a strong exam focus and a broad education. Well, I beg to differ. The link is indirect, in that exam accountability narrows teachers’ focuses and this has a knock-on effect. I can see this in my own school, where over the past two decades, a number of communal events have fallen by the wayside as the school grew and the emphasis shifted to bums-on-seats exam cramming. Likewise, the willingness of many teachers to participate in wider school activities seems to have lessened, and teachers’ own lives and practices seem to have become ever more focussed on exam-cram teaching. So while there may be no direct ‘tension’, for my money, the effect is still there. Finally, the ever-perceptive missdcox commented recently in her blog about teaching addiction – the way in which school consumes people’s entire lives, such that they feel any time not spent on school work is somehow a mark of deficiency on their part. She is all too right: it seems that many teachers just don’t know how to switch off. The common theme between the above anecdotes is ‘trying too hard’. In each case, the aim is sound: to provide children with the best education that we can. But they all make the same mistake of assuming that the way to do this is to increase the pressure and manage the process ever more closely. They assume a direct relationship between inputs and outputs, and this is the fundamental flaw of managerial culture. Instead, we need to accept that much of what happens in this world is not directly controllable; that much of what we want is at best a desirable by-product of our actions, and that aiming directly at often-intangible aspirations may simply result in failure. It’s not surprising that accountable managers don’t get this – when you are responsible, the thought of letting go must be petrifying. But we need to learn how to do it. The reason I am no longer in favour of teaching happiness is that you simply cannot teach (read ’manage’) it. The responsibility for finding happiness lies ultimately with each and every one of us. While this is not to say that one cannot study happiness in an academic sense, this is not the same as achieving it, and identifying happiness-causing factors may simply make people go chasing them in the same way that they chase wealth. And just as with wealth, happiness can only be achieved as a by-product of other, more productive activities. We would be much better simply creating happy schools than teaching happiness – it is an ethos, not a subject. And to do this, we may need to let go of many of the things we do that create unhappiness, whether for staff or pupils. After all, the two are linked. This is also the flaw with the Growth Mindset: again, it cannot be taught – it is another thing that needs to be in the atmosphere, part of the ethos, and actively foisting it on people (as Tomsett was also intending to do) may again be counter-productive. In order to achieve both happiness and a growth mindset, we need to let go, and stop trying too hard to achieve them. Give them space, create a wholesome ethos – and they will happen. This is the reason that Tony Little is correct too: excessive exam-emphasis is counter productive. Cultivating wide educational experiences does not come at the expense of rigour: it encourages it, but the DfE’s exam accountability has an indirect effect. Again it is a matter of ethos – a quality that might be said to be the most oblique, indirect educational variable of all. Over-pressurised, discontented teachers will pass those feelings onto children; exam-factory lessons will not cultivate a love of learning. We need to let go and allow school communities to breathe. And it is why missdcox speaks such good sense when she worries about teachers who are addicted to their job. It is one thing to be conscientious and another never to know when to stop. It will not do their work any good never to have a break. They too need to let go. It is also why my posts have become fewer over the holiday, and why I have decided not to take Old Andrew’s advice to start tweeting (yes, I was the unknown guy at the Brick Lane curry…). I hope my ideas are useful to people, but I need to let go too – and I do not wish to become a slave to edu-Twitter. If you like my ideas, please follow them up – and spread the word! If you have not read Obliquity, I strongly recommend that you do.